Every day, week and month and all throughout our beloved Argentina, diverse happenings take place and are worshipped and repeated year after year by different local communities that make up our towns, cities and provinces. 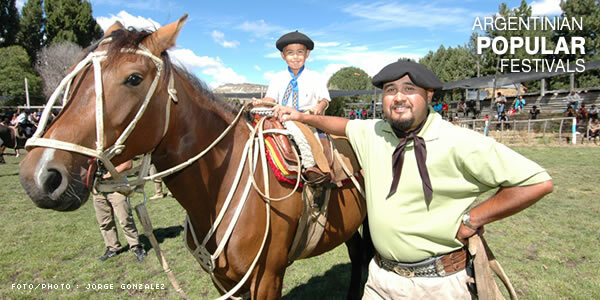 These 'Argentinian popular festivals' foster tourist development in our country and show a sample of the daily tasks carried out at each of the destinations visited not only by local travelers but also by a great deal of foreign visitors that attend these events searching to understand our customs, tastes and passions.What we have come to call: Argentinidad. A perfect excuse to enjoy tourism year round, from north to south and from east to west, the most important festivals in our national territory are held in the four directions. The Grape Harvest in Mendoza, Jesús María in Córdoba, Pachamama in Amaicha del Valle, El Dorado in Paso de la Patria, Fishermen in Mar del Plata, Snow in San Carlos de Bariloche, Carnival in Gualeguaychú, Yerba Mate in Apóstoles, Chaya in La Rioja, Folklore and Rock in Cosquín, and Beer in Villa General Belgrano, to name a few, along with a countless amount of local and regional festivals that are also essential value for our traditions. What does it mean to be Argentinian? How can we understand Argentina and its people? Answers may be endless, but attending some of the popular festivals held year after year is enough to come close to the right answers. Argentina, a country that has everything to show and has found out that popular festivals are one of the best excuses to get together again, to give us some time, a while to celebrate that we still are, in spite of everything, ourselves.